One of the rare and long-anticipated treats of being near New York City is the prospect of a live show. For practical reasons we don’t go to shows very often—years separate the occurrences—but once in a great while we manage to afford such a boon. Yesterday we attended the penultimate performance of the Cats revival on Broadway. The experience was transcendent. I’ve seen the movie version a number of times, and over the years I’ve caught a few live performances here and there. For whatever reason, this musical speaks to me. Although it doesn’t really have much of a plot—it’s more a series of vignettes—it is about redemption and being comfortable in one’s own skin. T. S. Eliot was a poet who knew spirituality intimately. Andrew Lloyd Webber, no one needs me to say, writes stirring music. Cats, unlike many shows I’ve seen, requires athleticism as well as vocal ability. The performers are in nearly constant motion as they play out their roles, often with acrobatic flourishes. Most of the parts are for the young, while those dwelling on the experience of older characters—Gus, Grizabella, and Old Deuteronomy—tend to be recollections of youth as a commodity that slips away leaving as residue the wisdom that comes with age. It’s quite biblical in that respect. Even the old can appreciate back flips and double cartwheels and the grace of ballet. For this particular production the lighting stood out as an integral part of the story. Illumination, I might add, is a powerful metaphor. In our family discussions afterwards, comparison with other versions dominated. Although my wife and I saw a community theater production long ago (placing us, I reluctantly suppose, in the ranks of the older characters), our main introduction was through the filmed adaptation. Again, like the Bible, we tend to think of canonical versions. This is how it should go. Because of both its running time and its demands on the players, not all vignettes are included in each production. The character who narrates the story may change. Choreography is adjusted. Each show, as is the case with live theater, is a little different. Standing in the snow on a cold, New York City December afternoon awaiting the opening of the doors, we wondered what would be changed. The original Broadway run had ended while we lived in the Midwest, so this was both our first exposure but also our fourth rendition over the decades. None, it turns out, could be called canonical. That, however, took nothing away from the inspiration of the event unfolding before our very eyes. The fear of insects is fairly common among people. It is difficult, however, not to appreciate the “hive mind” and how insects in colonies work for the betterment of all, often at the expense of the individual. Now imagine that the hive mind resents what humans have done to insects over the millennia. And suppose that their massive mind allows them to develop a hormone that transforms animals into partial humans with consciousness and, for the most part, workable hands. Then you’ve got the premise of Mort(e) by Robert Repino. 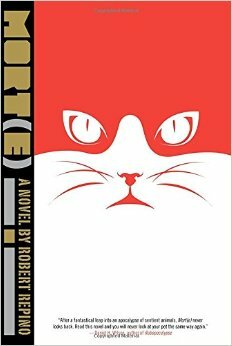 A debut novel about a cat (Mort(e)) and his desire to find a friend in the fog of war that follows the transformation of animals into people, the story is as compelling as it is creative. Add in a strong dose of religious concepts (Mort(e) is considered a messiah among the battered human population, and he has a prophet) and you’ve got a captivating story perfect for comment on this blog. While not all novels I read have a religious element, a surprising number do. And this isn’t because I pick stories with religious themes. It is because religion pervades the human outlook on life. Repino’s novel, however, does go beyond a casual mention of religion. It turns out to be central to the plot in a way that, were I to describe it here, would constitute a spoiler, and since I want to encourage reading of Mort(e), I don’t want to reveal too much. Suffice it to say, without religion a large part of the story would be missing. No matter whether you believe religion is good or bad, you’ll find plenty to think about here. These days I read novels liberally mixed in with non-fiction reading. Sometimes I’m disappointed after I spent a few hours on a book and find it to lack substance. (Sure, I do read as a guilty pleasure from time to time, but here I mean the kinds of books you invest in.) Mort(e) is a substantial story. The world in which the protagonist operates can be described as apocalyptic, and end-of-the-world scenarios have a way of raising questions about what we believe. The time spent reading Mort(e) is a good return on investment. And once it has been out there long enough, I’ll want to return to that plot spoiler to investigate it further. It’s that kind of book. While pre-celebrating Christmas with some friends recently, the topic of cats came up. This really isn’t surprising since two of the families present had been members of the local 4-H cats club. For a while cats were ubiquitous on the internet, but since I have so little time to browse the web anymore, I’m not sure if that’s still the case. Nevertheless, being near Christmas, someone narrated a story I’d never heard before. Tabby cats (like many jungle cats) have a distinctive marking in the form of an “M” on their foreheads. The legend suggests that on the first Christmas a tabby cat was in the manger. Seeing a mouse trying to crawl into the trough were baby Jesus lay, the cat killed the mouse, earning the thanks of Mary, who kissed it on the forehead, bestowing her characteristic M. It is a nice story (apart from the point of view of the mouse, I suppose)—an etiology to explain an evolutionary development in fur patterns. Shortly after that my wife sent me a story on the BBC about the oldest inscribed human artifact. Zigzag marking found on a fossilized clam shell from Indonesia suggest that Homo erectus was an abstract thinker, I’m told. The markings, which must at least be 430,000 years old, predate the earliest known human markings by 300,000 years. If accepted by anthropologists this evidence could rewrite all of human history. We had no idea that Homo erectus had time to doodle on shells. Looking at the photos accompanying the BBC article, I couldn’t help but notice they’re in the shape of an M. Perhaps Mary kissed these shells too? So etiologies begin. 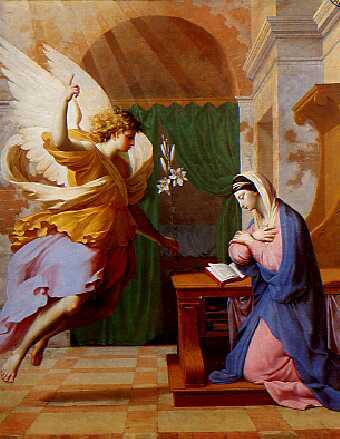 If you’ll pardon me for attempting to brush off my training in ancient languages, Mary of Nazareth was likely born into an Aramaic-speaking family. Her name, Mariam, would have been spelled with mem, which, although representing water is some scripts, took roughly this form: מ (assuming the Imperial Aramaic alphabet). If Mary were both historical and literate (the latter, at least, is doubtful) she would not have recognized the tabby’s distinctive mark as part of her name. It would have been an abstract symbol. Of course, God, being a natural lover of cats, may have had the Greek alphabet in mind, where the letter mu gives us our classical capital M. Mary, however, would probably still not have known what to make of it. We love to attribute significances to perceived patterns. The tabby’s distinctive M, as well as Homo erectus’s early exercises in penmanship present us with opportunities to continue making myths. And we should keep the myths in Christmas. Science and religion are often portrayed as fighting like dogs and cats. Both claim superiority and a comprehensive worldview that should make sense of everything. With reality television probing deep into the lives of rural folk who still hold to the old ways, it is easy to think that religion is awkward and backward and an embarrassment to the technologically sophisticated. In electrons we trust. As with most simplistic views, however, this dichotomy is overly dramatized. 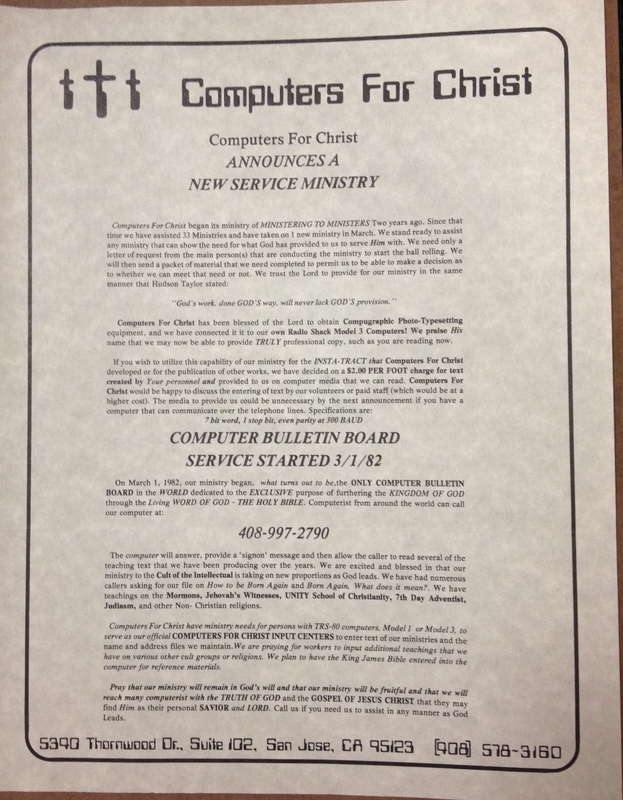 I recently found a flier for Computers for Christ. I didn’t have time to read it carefully, but the space-age font immediately told me that this was vintage 70s or 80s, back when computers were still so new that most of us had never seen an actual exemplar and we had to guess what the future might hold. Would these things catch on or not? A little closer reading revealed the date of 1982, back when I was a college freshman. I had, by that point in my life, never knowingly glimpsed a computer. Sitting here with a computer on my lap, and another in my pocket, I wondered what ever happened to Computers for Christ with its space-age crosses and early embracement of technology. I didn’t find anything that really matches it with a half-hearted web search, but it did make me realize that some enterprising Evangelicals had latched onto computers long before I ever did. I recall making a pact with a couple of friends my senior year in college that we’d never give in and use computers. Since I can’t find them online, my guess is that they kept their end of the deal. As usual, I caved. By 1985 computers had found their way even to Grove City College. A strange thing called a “server” allowed people to access it via multiple “terminals.” The computer science professor wore a large cross around his neck. I would go on to seminary and graduate with a second degree not ever having used such a device. Dogs and cats are both mammals, and neither regularly preys upon the other for food. Although Computers for Christ may no longer exist, the internet has been fully exploited by some of the religious. Jesus was an early meme. I remember when “the winking Jesus” was all the rage since an image on screen was actually animated! The savior virtually moved an eyelid! Now we can find Jesus doing everything from walking on water to riding on dinosaurs. The son of God has adapted to life on the web quite well, and often with a sense of humor. There are those who would argue that this is a travesty of true faith. There are others who would argue that it is a silly use of serious technology. I grew up with both dogs and cats and learned that when domesticated together they seldom fight. As I file away this aging paper, I wonder how the world might change if people behaved so sensibly. A few weeks ago the Internet’s attention was captured (if such a thing is possible) by rocket cats. Apparently the brain-child of sixteenth-century artillery expert Franz Helm, the story raised outrage and some giggles and then faded from view. In a recent Chronicle of Higher Education, however, the issue jetted back to life in an academic forum. The article by Steve Kolowich helpfully pointed out that the idea isn’t exactly new. My regular readers know that I advocate for animal rights and I believe most animals are far more intelligent than we deign to admit. In other words, I consider this an inherently bad and distasteful idea. Nevertheless, to look at it academically—Steve Kolowich was referring to the fact that the manuscript, being digitized from Penn University’s library, had been known previously. It went viral when the Associated Press decided to make something of the story. The Internet took an old idea and made it current. The idea goes like this: a city is under siege and you’re getting impatient. What to do? 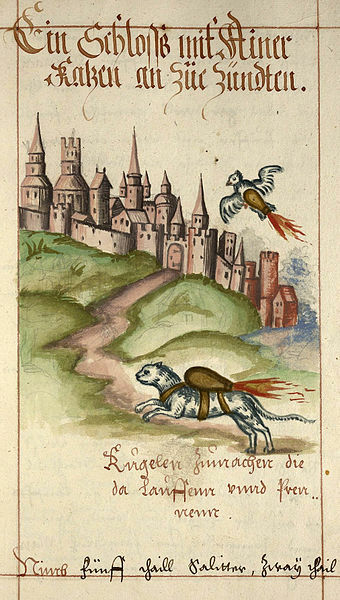 Strap incendiaries to cats and birds and send them into the city that is guarded against human-sized invaders. Although this does have an evil genius quality to it, I wonder if Franz Helm didn’t get the idea from the good, old Bible. In the commentary on the rocket cats I’ve seen, nobody is giving credit where credit is due. Samson, according to Judges, was fond of the ladies. Not just any ladies, but Philistines in particular. Prior to his wedding he set a riddle for the Philistines to solve and when they pressed the bride-to-be for the answer, Samson ended up owing the Philistines a fair bit of cash. Samson simply killed some Philistines, took their goods, and paid those he owed. Meanwhile, his father-in-law supposed, reasonably enough, that Samson no longer loved his daughter, and gave her to another. In a fit of rage, Samson caught three hundred foxes, tied torches between they tails of each pair, and sent them out to burn up the crops in the field. Substitute city for field and you have Helm’s idea. With steampunkish add-ons. In an era when the Bible is treated as increasingly irrelevant, the media (and scholars) frequently overlook how important it was to people in the past. You might even say it was inspirational. Despite all that, I’ve met a fair number of clergy who’ve never read the whole thing (it is a big book, after all) and meddlesome laity like yours truly often point out the more uncomfortable aspects of scripture. But even Samson may have to give a nod to the Hittites. Before Israel showed up on the scene, the Hittites, if i recall correctly, had figured out that it you sent a diseased donkey into an enemy’s city, the contagion would do the gruesome work for you, killing of people and well, the donkey was dead anyway. There was no Internet to spread the idea, but it was quite literally viral. Ancient manuscripts can teach us quite a lot, if we can take our eyes from the more questionable bits long enough to read the rest.